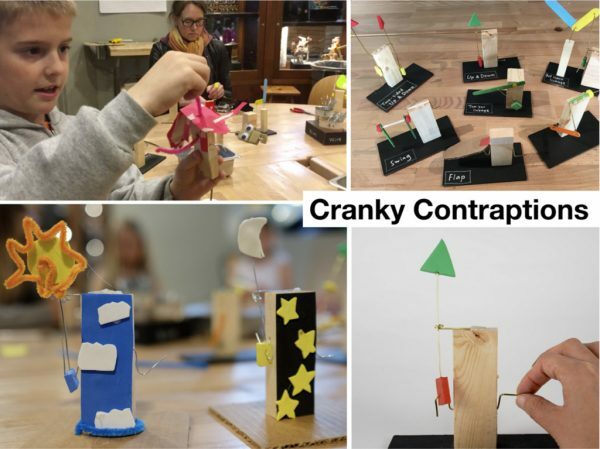 Automata activities – allowing space for inventing | #MakerEducation « Adafruit Industries – Makers, hackers, artists, designers and engineers! Great post by Sebastian on the Exploratorium Museum’s blog. Whenever we facilitate activities for our visitors, we thrive to support the kind of learning we describe in our Tinkering Learning dimensions framework. We often reflect on the drop-in workshops we do day to day in the tinkering studio with a specific aspect of the LDs in mind. One of the qualities I value a great deal in tinkering activities is that learners are encouraged to work without a blueprint whenever possible. I think that this process of “inventing” instead of copying fosters a deeper understanding of the topic at hand.